For the past couple of years I was using a very cute meal planning and shopping list set. At the start of 2017, I went to print out a set for this upcoming year and could not find the file on my computer. I went to the blog I got it from originally and that blog had vanished. The file could no longer be found on the internet. And thus it was time to create something ourselves. However, we decided to take one giant leap into the computer age and create a shopping spreadsheet. You have no idea how much time this saves me – and how many times it has saved me from arriving home without the items I need. And today we are providing you with a spreadsheet you can modify and use for yourselves. When I would write the Aldi shopping list down on paper, I would mentally walk around the store in my head so that the items on the list appeared in the order I will find them in the shop. They have not changed the layout in our Aldi for many years so this is easy to do. Some of you will have the exact same layout as we do. It is not quite so easy for Coles because they are forever moving things. The amount of items I buy from there is constantly decreasing – they are now removing a lot of the items we like from the shelves. In recent weeks, my favorite blueberry scented rubbish bags, peanut butter powder, and now BEERENBERG tomato sauce have vanished entirely. I do envision a day when we do not go there at all. There have been weeks where we only bought Manning Valley eggs. Guess what happens when you take away the items I want, Coles? No, I do not buy your down down version. In many cases I try out the down down version at Aldi, which usually happens to be cheaper and better than yours anyway. 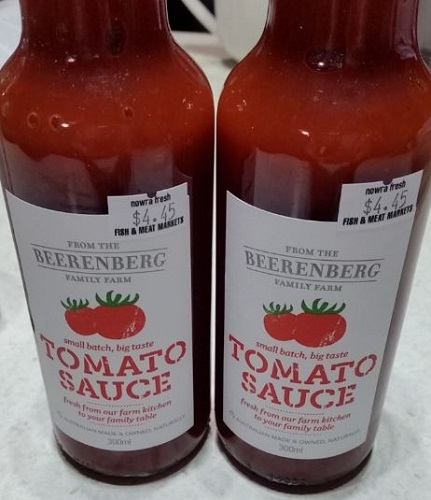 For items I am not willing to compromise on, like Beerenberg tomato sauce, I go elsewhere and I buy in bulk when I do that. At least two other places stock Beerenberg locally, so I will buy it there. Less money in the Coles till. Whoops, Coles! I am not a spreadsheet star but The Other Half is. Magically he created a spreadsheet that only prints the items I need with a number next to them on the final version. So how does this work? Step 1 – I go in to the spreadsheet and save it with today’s date, so I do not screw up the original and I don’t have to remove all the numbers I added later.. 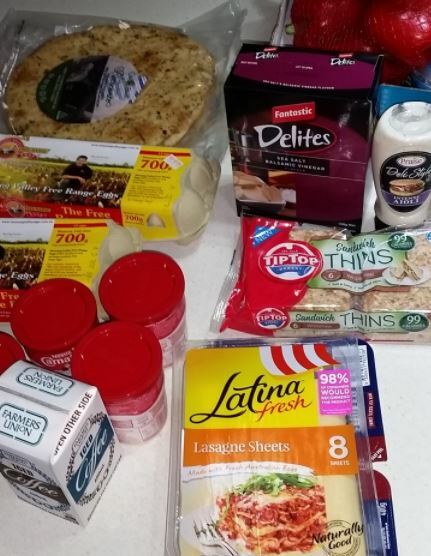 Step 2 – I enter in how many of each item we need to buy. For things like vegetables I usually just put a 1 if we need it because I know how much I will need to get of each item. Step 3 – I click on the print tab at the bottom which takes me to a new screen where only the items with a number appear. Step 4 – I check over the list and make sure it is correct, then we print it out double sided – Aldi one side, Coles the other. We are creatures of habit here in this house, so the things we tend to buy are usually the same each fortnight. Here you can grab your very own all set up, empty and ready to customise Shopping List Empty – The Other Half has put in some notes for you about how it works. If you want my version which includes all the things we regularly buy, you can grab that here – Snoskred Shopping List. You can also grab Libre Office which is like Microsoft Office only completely free here – that is the program we use for all word processing and spreadsheets. Very clever! I love spreadsheets. I have a similar spreadsheet, done in “landscape” with more columns and I printed it out, backed it with thin cardboard, then covered it with contact paper. Now I just tick the things I need as I run out of something or try a new recipe, then when I get home, I wipe it clean so it’s ready for next time. I had mine separated into sections like Bakery; Dairy; Meat; Freezer; Canned goods; Paper Products and so on. I think I got the original template from the same website you got your original and modified it to suit myself. I find it VITAL to be organized with the shopping/meal planning. I feel stress at the slightest thing so I need that organization! 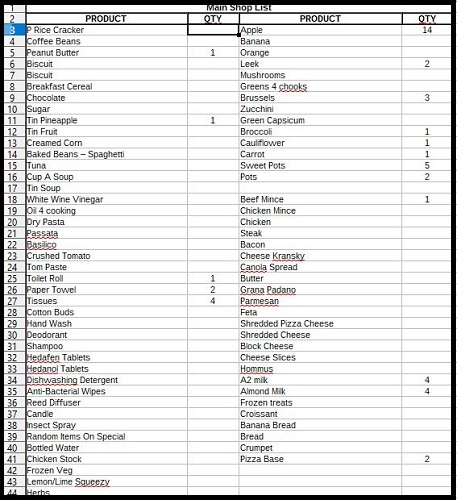 I have a “check list” and I print out my shopping list on Excel, it’s a life saver! Your levels of organisation are incredibly high though Rain, I love everything you do. ;) You are incredibly skilled at meal planning.